Prior to arriving to New Olreans, we took our students to the Desperation Conference in Birmingham, Alabama. I was surprised how normal Birmingham was since it was in … Alabama. It was an experience filled with souther drawl and terrible driving skills. There were good things too like Krispy Kreme. I was disappointed though that I didn’t meet anyone named Bubba. Anyway, the Desperation Conference was put on by New Life Church’s student ministry in Colorado and the host church, Church of the Highlands in Birmingham. Evan and I felt that the conference was needed for a several reasons (and I think more became apparent while we were there). One, was to help be prepared spiritually for the mission trip. No matter how much you stress throughout the year, it always seems that more could have been done. Second reason was that decent conferences generally don’t come to the Northeast. (No offense to Battle Cry-Acquire the Fire but I think you need to tone it down and until you do, we won’t be participating). Thirdly, to see something different. There’s a lot to say about that but not saying it works too. One of the themes that the speakers and worship leaders had repeated was the difficulty they’ve experienced this year. The references to Ted Haggard and the tragic shootings at New Life have got me thinking about a couple things. It seems that one of the points they made as a leadership was not to slow down the ministry. This would have been a good year to say, given our situation maybe we should suspend some of our ministries or go into a “safe mode”. This has personal significance to me personally. This also has significance to me as one of the pastors at our church. Being without a sr. pastor for the past year (but our new sr. pastor is coming at the end of Aug. Praise God for sending us a great man. I’m excited, grateful and eager). In the absence of a sr. pastor, I know sometimes we as a leadership felt that we should wait until the new sr. pastor arrives. Mostly it was to not intrude on the coming sr. pastor’s vision and possible ideas. There were other times, when we could have just said, “let’s wait” but didn’t because leadership was needed at that moment. My point – rare is the time right to do something difficult, enormous, and controversial. Certainly all that a church seeks to do must be grounded in where we feel the Spirit leading us after prayer, Scripture, communal discussion, and many other factors. But the timing is hardly ever ideal and I find myself thinking about that today. The first speaker of the Q Conference was church planter, Jon Tyson. Born and raised in Australia, he was the young adult pastor in a mega-church in Orlando and a couple of years ago started Origins Church in Manhattan. I’ve met Jon a couple of times (even brought my youth group to see him, and yeah, I know, our kids are so lucky, I mean blessed, to have a guy like me taking them to a guy like Jon.) and really appreciate his humility. He speaks with a lot of wisdom and brings great ideas and insights to his audience whether it be on Sunday mornings or to a group of fellow leaders at a gathering like this. – So true. The success of our churches have been on that individual level. We all know people who have radically changed their lives through the power of the Gospel and through the discipleship and encouragement of their local church. What we haven’t heard nearly as much are the stories of churches that have had similar impacts on their communities. – Thus the long-term causality has been the minimal effect the church has had on the culture. We’ve retreated from it, been told it was evil or worldly. For a long time, the church was only a refuge and not an agent of transformation and now many of them are becoming monuments. Return where cultures are created. – Jon and later fellow NYC pastor Tim Keller, called for a return to the “city”. This was more then an anti-suburban cheer but was more of a vision-casting of the hope and need of a city. I’ve always loved many parts the city, (and I enjoy certain parts of the burbs too. Who knows what is in store for us? But back to Tyson and Keller.) but the idea was to be a part of the city. To see it for it’s potential, to see it’s not only worth saving, but worth loving. They didn’t say this, but all the emphasis that we put on the burbs, maybe we can be as faithful in the city (or attempt to be). – We read things like this and we react because the cities do not have the best public schools, have more crime, polluted, crowded and expensive. But we all know that at the end of the day, generally speaking, we live where we want to live. We don’t want to live in the city. I found myself convicted on this yet again. – Cultures are created in the city. That line alone is a lot to think about. He called for the need to create “a holistic theology relevant to our time”. – Not sure I can put these thoughts into words yet. I find myself nodding ‘amen’ but that’s all I got so far. Yes, things need to change. To all who appreciate Erwin McManus, it’s not often that he makes it to this coast (or if it is, I never know). On April 9, 2008, Bethel Seminary of the East is bringing in what’s called, “Imagination in Ministry” to the Grace Point Church, in Newtown, PA. Costs $28.Here’s the link . 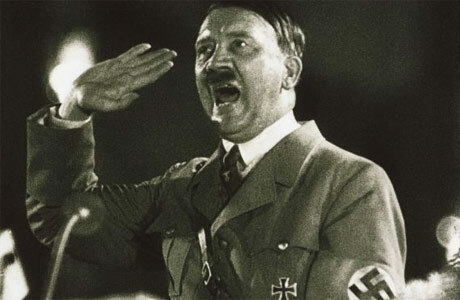 Can Hitler be considered a leader? In seminary we are answering an assigned question via blackboard on whether or not Hitler could be considered a leader. But I see our conventional definition of ‘leader’ as an amoral one. And we need to rely on adjectives to describe the leadership. In fact, I would like to take it a step further and suggest that Hitler was an exceptional leader. Not in terms of morality, of course, but in terms of influence. Consider this: he takes such an evil idea, promotes it by propaganda justified by a booming economy, has soldiers (and citizens) perform and justify terrible acts against their natural human conscience, all because he ordered them too and it takes the most powerful armies on the planet to stop him from taking over Europe. This is exceptional leadership. Yes, he preyed on the greed, selfishness, and fears of his followers. Indeed he was a liar, manipulator and monster but he was leading many for his cause. We as pastors get frustrated that we can barely move people in the right direction for the best of reasons they not already agree with but claim is the most important cause of all! I find myself a embarrassed after thinking about this. The last thing we need is any more sugarcoating but I am looking forward to the day when Barna gives us some good news. Pastors appear to brim with self-confidence, display good communication skills, and have rigorous, demanding schedules, but many also struggle to make and keep friends. And eventually, a large percentage pull back from life’s challenges. A new study by The Barna Group shows 61 percent report difficulty creating and maintaining personal relationships. Dr. Louis McBurney, founder of the pastoral counseling center Marble Retreat in Marble, Colorado, says a majority of pastors in his care cited “lack of emotional intimacy with others” as the main factor in their decision to seek counseling. Over a long period, this makes pastors guarded. Barna’s study found that pastors’ potential for risk-taking drops off after 20 years in ministry. Pastors who spent 20 years or more at the same church were found to be particularly risk-averse. In other words, without carefully cultivated friendship and fresh challenges, pastors can begin to resemble the Maytag Repairman. Copyright © 2006 by the author or Christianity Today International/Leadership Journal. Click here for reprint information onLeadership Journal. Mark Driscoll cracks me up. This was taken from a page of advice from ministry leaders. Click title for more.